צד אחד דמותה של מלכת אליזבת' השנייה והמילים "Elizabeth II Australia 2 Dollars 2 oz 999 Silver 2017"
הפוך תרנגול, תרנגולת ושלושה אפרוחים מוקפים בעלווה והמילים "Year of the Rooster" וסמל הסיני ל-"תרנגול". דמותה של מלכת אליזבת' השנייה והמילים "Elizabeth II Australia 2 Dollars 2 oz 999 Silver 2017"
תרנגול, תרנגולת ושלושה אפרוחים מוקפים בעלווה והמילים "Year of the Rooster" וסמל הסיני ל-"תרנגול". מטבע כסף Perth Mint שנה לונרית שנת התרנגול שנת 2017 משקל שתי אונקיות For 2017, the Perth Mint's internationally renowned Australian Lunar Silver Coin Series II features the Year of the Rooster, the tenth animal in the 12-year cycle of the Chinese zodiac. These superb quality releases are perfect for people born in "rooster" years - 1945, 1957, 1969, 1981, 1993, 2005 and 2017. They are regarded as hardworking, confident and courageous. Roosters are talkative and like to be the centre of attention. The reverse of each coin depicts a rooster, a hen and three chicks surrounded by foliage. 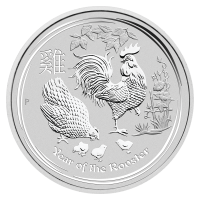 The Chinese character for "rooster" and the inscription "Year of the Rooster" also appear in the design along with The Perth Mint's traditional "P" mintmark, the year and weight. As well as appealing to silver coin collectors, these outstanding releases also make great gifts for people born in any year "ruled" by the Chinese lunar rooster.